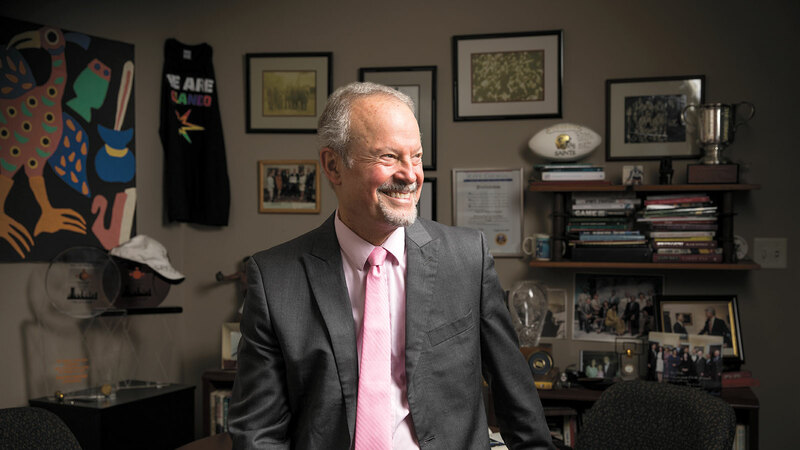 An eminent scholar, endowed professor and director of the DeVos Sport Business Management program at UCF, Richard Lapchick believes in the power of sport to bring people together. The first time Richard Lapchick heard the N-word he was 5. Some men had called his home, shouting racial epithets at his father, calling him an N-word lover. The 5-year-old didn’t know what that meant, the N-word, but he could hear the fury, the rage in the men’s voices, and he didn’t want his father to be something bad, something that made people hate him. But those men did hate Joe Lapchick — all because he, head coach of the New York Knickerbockers, had signed Nat “Sweetwater” Clifton, the first African American signed to the NBA. Young Lapchick didn’t know that the men on the other end of the receiver were referring to Clifton when they used the N-word. He knew Clifton, as he knew Carl Braun and Harry Gallatin and Vince Boryla and the other stars on the team. 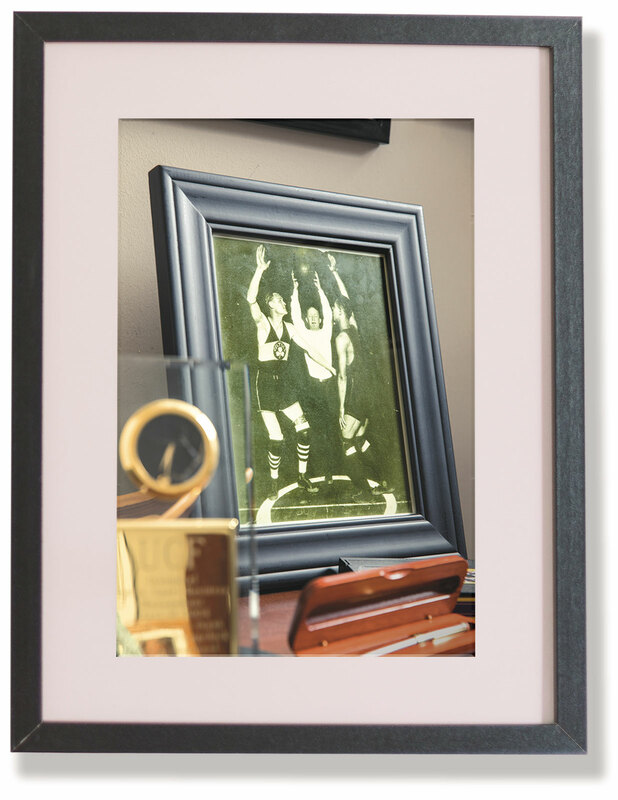 He watched Clifton play on the courts of the old Madison Square Garden. He saw him treated as one of the guys in the locker room after games. Nothing about Clifton playing with the Knicks should make people angry, he thought, unless you were rooting for the other team. But this was 1950 in America, only three years after Jackie Robinson broke baseball’s color line and played first base for the Brooklyn Dodgers. It was four years before the Supreme Court ruled it unconstitutional to force little black boys and girls to attend different schools than little white boys and girls, and nearly a decade before the civil rights movement gained momentum. Segregation was the norm in schools and dining facilities and buses — and also basketball courts. “Born just before the Jackie Robinson era, I was so oblivious to the reality of inequality in sports that I was unconscious even of my own father’s role as a quiet pioneer in bringing about racial change in American basketball,” wrote Lapchick in Smashing Barriers, one of 16 books he’s authored. He has received a Lifetime Achievement Award for Work in Civil Rights, won the Arthur Ashe Voice of Conscience Award, and been named among The Beyond Sports Inspirational 50, which recognizes people who have used sports to change the world. He has also earned the respect and friendship of many who have fought to make sports and society more equal, such as three-time world champion boxer Muhammad Ali and South African President Nelson Mandela. 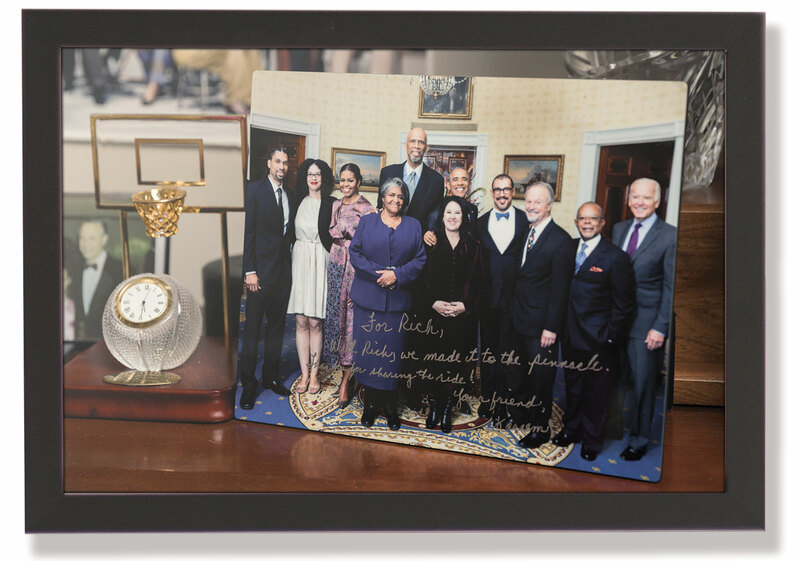 In November, Lapchick (3rd from right) was the guest of Kareem Abdul-Jabbar when President Barack Obama presented him with a Presidential Medal of Freedom. His commitment to equality earned him an invitation from Pope Francis to the Vatican to discuss with other leaders the ways faith and sport can better serve humanity. He serves as president of the National Consortium for Academics and Sports, and in 2001 he founded the DeVos Sport Management program at UCF. An emphasis on diversity, service, leadership and ethics drives the program that has been named one of the nation’s top five by The Wall Street Journal, The New York Times and ESPN The Magazine. And while many strides have been made in addressing racial inequality since 1950, when strangers made threats against his father, hanging his effigy in their front yard in Yonkers, New York, Lapchick knows things are still far from equal. By the time he was 15, Lapchick had heard the N-word said so often to a teammate that he could no longer be silent. 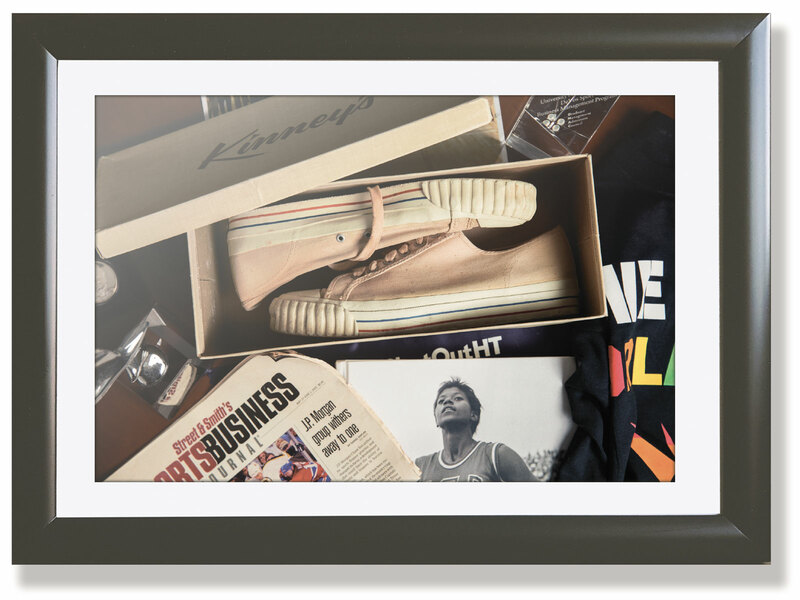 It was the summer of 1961 at Friendship Farm, a basketball camp in Saugerties, New York. One of the campers, Lew Alcindor, was a tall, shy and promising ball player. He was also the only black player at the camp. And as his talent became increasingly apparent on the court, so did the frequency with which one of the white campers called him the N-word. Maybe the camper was jealous or trying to get inside Alcindor’s head. Either way, Lapchick grew fed up and told him to stop. Enough was enough. Lapchick and Alcindor shared the basketball courts and a room, but they weren’t particularly close. They were friendly but not yet friends. “It was the first time I had lived with someone who was black,” Lapchick wrote. And he could see that Alcindor was having a difficult time. As a result of the confrontation, the camper punched Lapchick, knocking him out cold. Lapchick was down but not out. He had gained the admiration and lifelong friendship of Alcindor, who would later change his name to Kareem Abdul-Jabbar. The two both fought against racism and other social injustices, including apartheid in South Africa. And last year, Lapchick sat front row at the White House when President Obama presented his friend with the Presidential Medal of Freedom. This is President John C. Hitt’s response today when asked about the time in 2005 when UCF played in its first bowl game. It’s a bold confession but not an easy one. That year, Lapchick publicly released the student-athlete Graduation Success Rate and Academic Progress Rate for the bowl-eligible teams, a report he compiles every year through The Institute for Diversity and Ethics in Sport at UCF. The Knights had the worst GSR and next-to-worst APR score of all 56 teams competing that year. Lapchick’s father, Joe Lapchick (left), dedicated his life to basketball. He played for the Original Celtics and the Cleveland Rosenblums, leading the latter to successive championships, and coached for St. John’s University and the New York Knickerbockers. Lapchick knew those numbers would not reflect well on UCF, and he received calls from colleagues asking why he released them. But he’s released these reports every year since 2002. And he continues to generate them every year for college football, as well as men’s and women’s basketball, to hold teams accountable, to ensure the emphasis is as much on academics as it is on athletics. Increasing Lapchick’s admiration, Hitt thanked him. “Hitt shook my hand and said, ‘Thank you for holding our feet to the fire. We are going to get better as a result,’ ” Lapchick recalls in an article on ESPN.com. Hitt is rightfully proud. When the Knights played in the Cure Bowl this year, UCF athletics ranked No. 1 in the nation among Football Bowl Subdivision public institutions for overall GSR and No. 6 for APR. Success stories like the one at UCF are the reason Lapchick does these reports and relies so heavily on stats and figures. In the 1970s, Lapchick fought against apartheid by leading the boycott of South Africa’s participation in international sporting events. 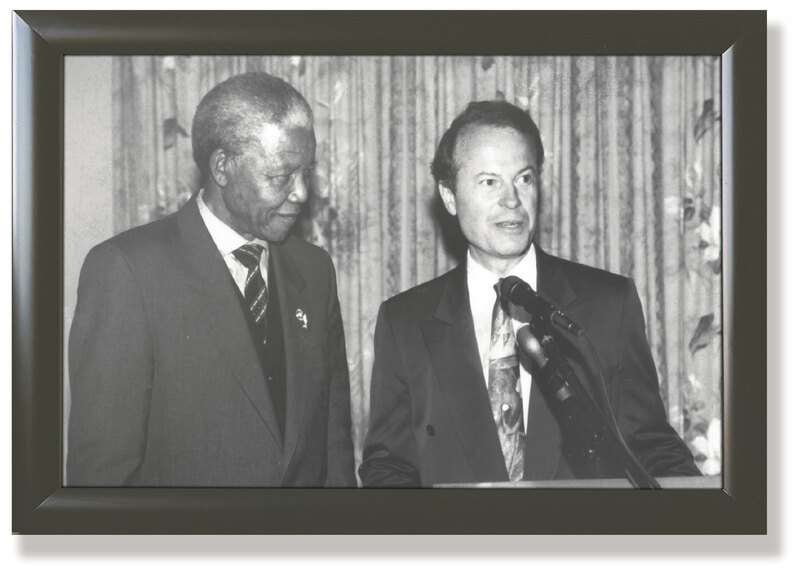 His activism earned him an invitation from Nelson Mandela (left) to his presidential inauguration in 1994. In 1978, at the age of 32, Lapchick would learn that progress does not come without pain. At about 10:45 p.m. on Valentine’s Day, he was attacked in his office on the Virginia Wesleyan College campus. He was working later than usual, when two men — tall, muscular, masked and white — entered his office and shoved a thick winter glove in his mouth. Using a steel sculpture from Lapchick’s office, they hit him repeatedly while calling him an N-word lover, the same epithet used against his father almost 30 years earlier. Lapchick passed out from the pain. When he woke up, the men were kneeling over him, cutting his stomach with office scissors. “You know you have no business in South Africa,” one of the men said, before a noise outside of the office caused the men to leave quickly. Lapchick was leading the boycott of South African participation in international sporting events. As the national chairperson for the American Coordinating Committee for Equality in Sport and Society, he had been “campaigning to end all sports contacts between the U.S. and South Africa, as long as sport and society [in South Africa] were segregated.” At the time of the attack, Lapchick was focused on stopping South Africa from competing during the Davis Cup tennis match, which was scheduled to take place that year at Vanderbilt University. In the late 1970s, Lapchick began working for the United Nations. 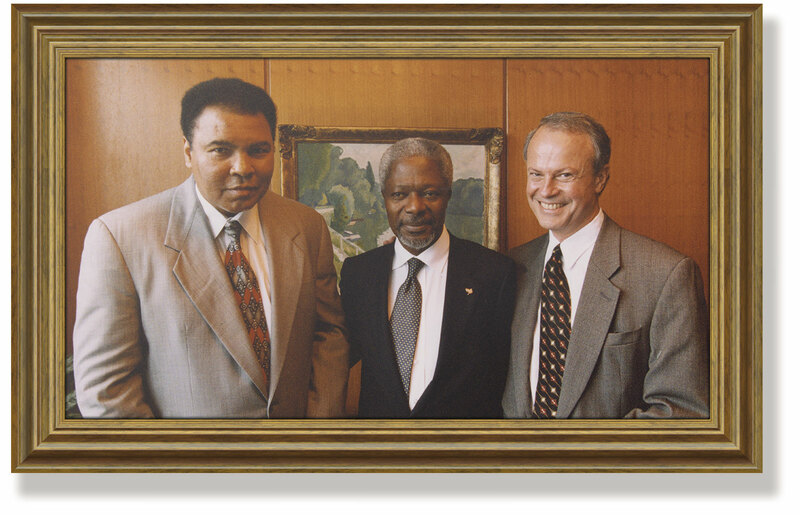 While organizing a protest together, Kofi Annan (middle), then a staff member, asked if Lapchick could get Muhammad Ali (left) to speak to the General Assembly. That began more than 35 years of friendship between Ali and Lapchick. This was not the first time Lapchick had received threats for his work, but it was the only time he was attacked for it. The local police and some newspapers questioned his account of the events, whether it was unknown assailants or Lapchick himself trying to get publicity. He was forced to complete a lie detector test, which affirmed his account, as did a New York medical examiner. There was also the physical evidence on his body: He was left with a concussion, kidney and minor liver damage, a hernia and the N-word, misspelled with only one G, etched across his belly. In the hospital, as he recovered, he wondered whether he should keep fighting against racism, against apartheid, whether it was all worth it. From his bed, he overheard three African American nurses talking and one said, “I didn’t think white people cared.” For Lapchick, that was just the encouragement he needed. Though many financial backers backed out of the event and protestors outnumbered attendees, ultimately, the U.S. would compete against South Africa that year. The next year, however, South Africa was excluded from the Davis Cup and not allowed to compete again until 1992. 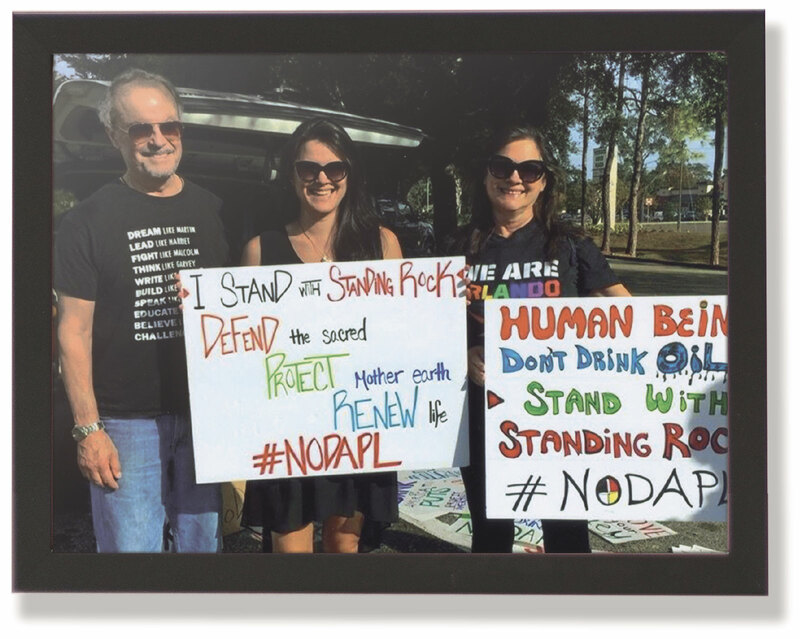 Lapchick protested the Dakota Access Pipeline along with his daughter, Emily, and wife, Ann. “I’ve been fighting social justice issues with my wife, Ann, for 30 years. To be able to do them together and be joined by Emily as a family has been an incredible blessing and incredibly profound for me,” Lapchick says. But Lapchick makes sure his voice is heard — through the more than 550 articles he’s published and 2,800 public speeches delivered. He believes in the power of sport to produce change because in his 71 years, he’s seen that change, been a part of causing it. He has infused this ethos into the DeVos Sport Management program, and his service extends far beyond sport, too. In 2006, Lapchick, along with his wife, Ann Pasnak, his daughter, Emily Pasnak-Lapchick, and a group of DeVos students, started the Hope for Stanley Alliance, which works to rebuild communities affected by natural disasters. As of this December, Lapchick, Ann and students from the DeVos program have spent a total of 50 weeks in New Orleans, rebuilding more than 125 homes in 10 years. And when Emily took a college course about human trafficking, the whole family became involved in learning more and has since taken up the issue. Emily is now the manager of the End Trafficking Project at UNICEF, and Lapchick has called addressing human trafficking “the last new social justice issue that I’ll spend a significant amount of time on.” The Shut Out Trafficking program that they both promote has worked on more than 25 campuses, educating more than 50,000 people about human trafficking and how to end it. When Lapchick first met his wife, Ann, in 1972, she owned this pair of Joe Lapchick sneakers. “That was telling us fate was behind it,” Lapchick says. He didn’t have to be a person of color to fight against racism. He didn’t have to be a woman to fight against sexism. He didn’t have to be gay or lesbian to fight against homophobia. He didn’t have to be Jewish to fight against anti-Semitism. He didn’t have to be a Muslim to fight against Islamophobia. He didn’t have to be poor to fight against poverty. He didn’t have to have a disability to fight for the disabled. He didn’t have to be an immigrant or refugee to fight against xenophobia. He knew that we are all part of the same human fabric and family.